Explanation: You might not guess it, but sunrise was still hours away when this nightscape was taken, a view along the eastern horizon from a remote location in Chile's Atacama desert. Stretching high into the otherwise dark, starry sky the unusually bright conical glow is sunlight though, scattered by dust along the solar system's ecliptic plane . Known as Zodiacal light, the apparition is also nicknamed the "false dawn". 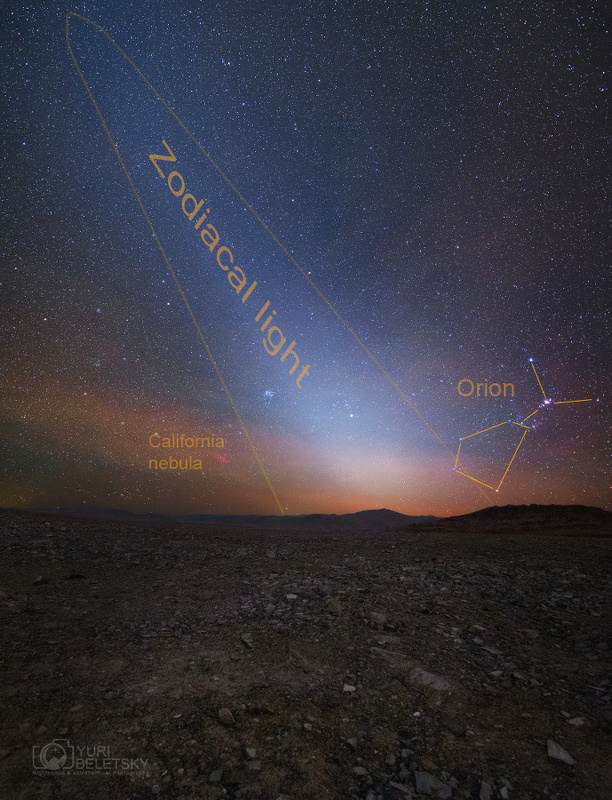 Near centre, bright star Aldebaran and the Pleiades star cluster seem immersed in the Zodiacal light, with Orion toward the right edge of the frame. Reddish emission from NGC 1499, the California Nebula, can also be seen through the tinge of airglow along the horizon. Sliding your cursor over the picture (or following this link) will label the sky over this future site of the Giant Magellan Telescope at Las Campanas Observatory.